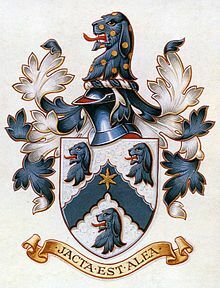 The motto of the Hall family from Shackerstone says jacta est alea. Alea iacta est is a Latin phrase that means "the die is cast (thrown)". Suetonius said it to Julius Caesar on January 10, 49 B.C when he led his army across the Rubicon river in Northern Italy. It means things have happened that can't be changed back. The phrase, either in Latin or in translation, is used in many different languages. This page was last changed on 10 May 2018, at 13:44.